While I normally name our long runs when I map them out on Map My Run, nothing has been as good as what our 8 miler became called on Saturday morning, thanks to Brian. He was going over the route beforehand with Cary, saying "Run here, BOOM. Run there, BOOM. Run that Jiggy-Jag - done." - and with that, the Boom Boom Jiggy-Jag route was born. It even surpasses Harvey Harvey HARVEY, which was my favorite name until this one. So it was a miracle - we had 8 miles on tap for Saturday, and we actually ran all 8 miles for a change! Maybe it was the nicer weather, maybe it was needing to stomp out some election frustration, or maybe it was the Boom Boom Jiggy-Jag inspiration, but whatever the factor, we all had a good run. It was 55 degrees (but 98% humidity, which made it feel warmer than it was) when we started running - Diane and I did our standard 2:45 intervals. While we run straight through when we run together during the week, we do intervals for higher mileage runs. This works pretty well for us, especially during some of the tougher parts of our route - just knowing that I only have to run for two minutes helps to keep me going when I otherwise might take an extended walking break at some spots. Case in point: we had to run up a hill for a quarter mile, and then we turned and ran another half mile that has a subtle, yet brutal climbing grade. I don't mind the first hill so much, and as it turned out, our interval had us run the entire thing, but man oh man, the second part is hard! So getting a little 45 second walking break a few times during that half mile is huge; we both hate that section, but once we're past it, the rest of the run doesn't seem as bad. The only strange thing about this run was that it took forever - about four miles - to finally feel like I was in the groove with running...and then, around mile 5.5, I really felt great. I didn't think I had a good explanation for the surge until I remembered it was around that point when we saw a young deer run across the street just ahead of us, followed by a bigger deer who did a spectacular leap over a huge clump of bushes; maybe seeing that helped energize me to pick up the pace. I finished the last few miles with negative splits, with mile 8 being the fastest of all, which was very unusual for me. Plus, I was just so happy to actually have run what we set out to do that I wasn't paying attention to anything except for distance on my Garmin; so seeing my splits later on was a pleasant surprise. 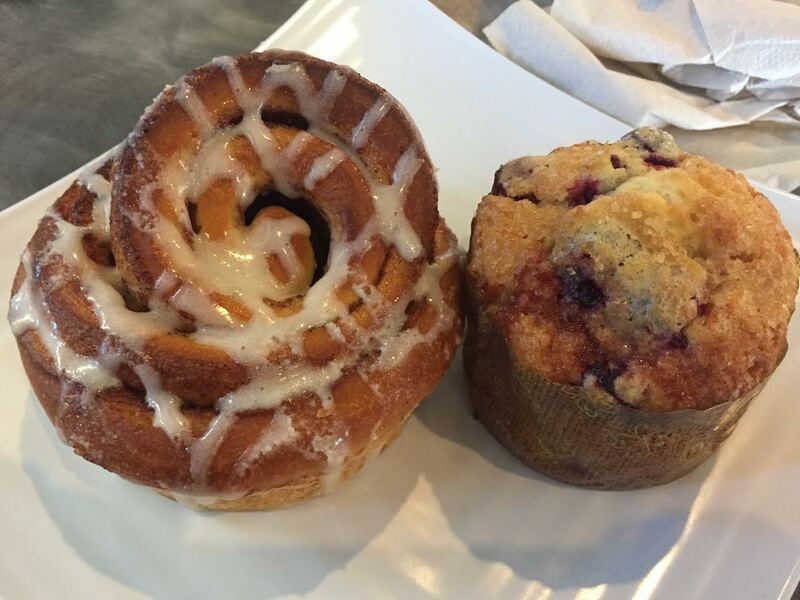 Split the cinnamon roll with Jeff; ate the entire cranberry-walnut muffin myself. Between spending a little extra time in the sun beforehand, and enjoying the company at Blue Baker, we didn't end up back home until noon! That is my kind of Saturday...wake up super early, go for a run, and then spend the rest of the morning with people I like, along with lots of hot coffee and yummy baked goods. I love how you name your running routes! I never knew that. Also, after all this time of reading your blog I finally figured out what FMM stood for (I'm assuming Friday Mish mash) but I can't figure out WWU. What's that mean? You are correct on FMM! Wednesday Workout Update is this one...used to be more appropriate back when I did a variety of workouts with a trainer, but now it's all running. Still, I can't let go of the WWU! Oooooh I want a Boom Boom Jiggy Jag Run! It just sounds fun! I also want that cinnamon roll. I must admit I fear should I ever get to Blue Baker I will eat all the things. I swear, some days when we go to BB, it's like we're all kids in a candy store, pointing and choosing everything. Many items that start out on a plate end up getting wrapped up and taken home for later, though - runger causes some extreme choices that our stomachs can't actually finish, LOL. I think I need to name my running routes! I have the pond, the path, the forest preserve, and the preserve. Man. Boring. I bet if you look at some distinguishing parts of your routes, you can come up with some good names for them. Ha, love the name of your run! I'd be saying that the whole time I was running! The other day I was running intervals, and every single run interval seemed to end on an uphill. Great, because I really want to charge up those hills only to walk the downhills! Sounds like a nice run though, especially if you ended on negative splits! I swear, that's usually how it goes for me, too, with intervals - I want to run the downhills, dang it!! I love the name of the runs!!!! Glad you're having nice weather. We're in the middle of 3 days of record high temps AGAIN- today around 87! I had to turn the dang A/C back on .again. I had to turn our A/C on yesterday, too! I hear a cold front is coming in on Friday - FINGERS CROSSED. That sounds like a great Sat am! I love the name of this route, ha! When I am training for something longer, it takes me forever to get in to the groove of a run - have you ever noticed that before this run? I am excited you were able to do the full distance you intended this week!!!! YAY! Usually it seems to take me about a mile and a half to get into the groove on a longer run - this was a record, I think. I'm not sure it relates to your 5.5 mile point, but when I'm walking, for more than half the walk, I'm thinking, I can't stand this, everything hurts. But by the time I'm three-quarters through, I start feeling better, and feel like it was all worth it to feel better and be exercising. It's the pushing through that "everything hurts and I'm dying" feeling that is so challenging...once I get beyond that, I'm good to go. Pickle pop? Is that a pickle juice popsicle? Yes! It's like an Otter Pop, only pickle juice. Really refreshing after a sweaty run, although you have to be able to stand the sourness. There is no better way to spend a Saturday morning! Love the name of the run. Love your route names. That is my kind of Saturday. Unfortunately I have to run a race.